Use this 4 drawer cabinet with the H5650 Baby Roller and give yourself all the heavy-duty storage you need! Makes a great stand alone unit, too! Features include handles, drawer liners, ball bearing slides, durable powder coated paint and lock and keys. Cabinet measures: 26" W x 19-1/2" H x 18" DDrawers measure: 3 @ 22-5/8" W x 2-15/16" H x 14-13/16" D, 1 @ 22-5/8" W x 6 " H x 14-13/16" DWeighs 96 lbs. 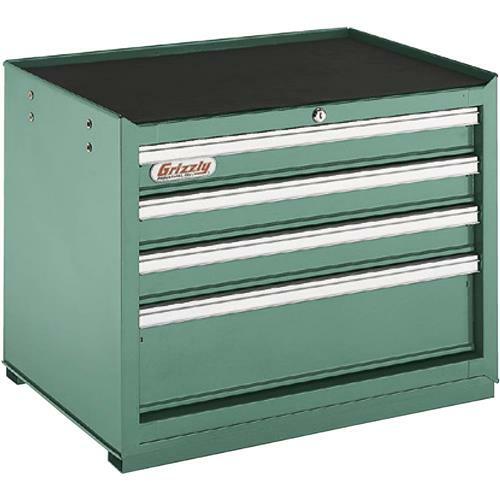 I bought this tool box for the shelf under my 12 inch table saw. The catalog has a different box but I wanted the deeper drawers. I like it!